1 PACK, BRAND NEW,STILL IN PACKAGE 5 X 7 TOPLOAD HOLDERS. 25 PER PACK. 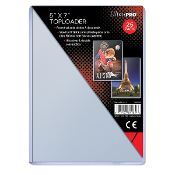 Holds postcards and photos - Crystal clear - Made of high impact rigid PVC.